What are our opening hours and how long are our terms. 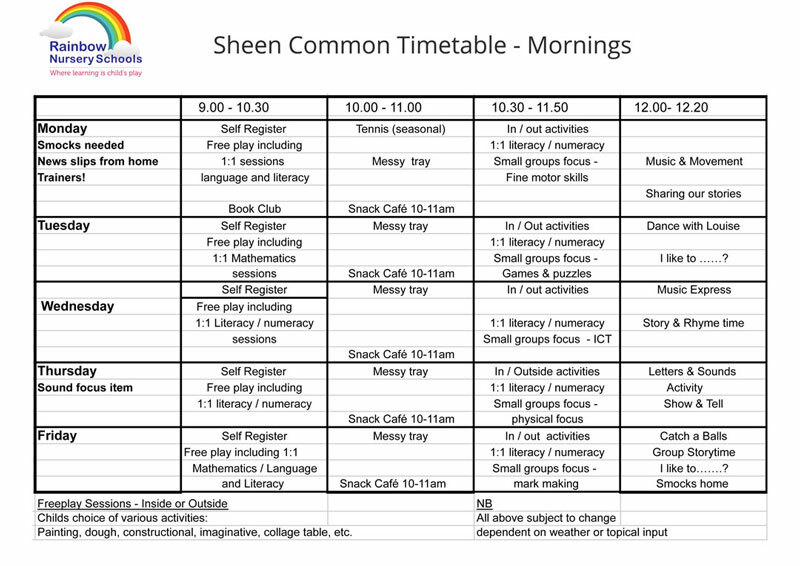 Children attend for 5 mornings a week 9 /9.15am to 12.30pm, or 5 afternoons a week 1.00pm to 4pm, 3 terms per year approximately 10-12 weeks in duration. Children are accepted from the age of 2 years (depending upon the child’s capacity). Our terms run for 10 – 12 weeks and we have 3 terms per year. 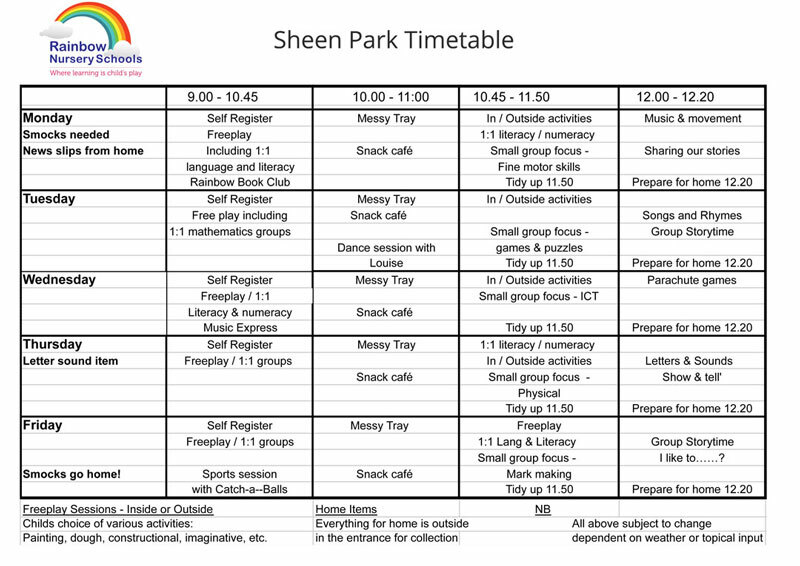 Half term – Monday 22nd – Friday 26th October. Thursday 6th December – Christmas Concert for ALL the children – No afternoon nursery this day! What aged children do we take? We can only take children from the ages of 2-5 years old. Where are our Nursery Schools? We have 3 nursery schools at the following locations. Click on any location to read more about it. Our fees are reviewed annually and can be found here. View our fees & Funding policy here. How do we rate with Ofsted? Rainbow Nursery Schools, founded by Mrs Julia Hunter, has been serving the families of Richmond and Sheen since 1979. Mrs Hunter retired at the end of the Summer Term 2017 and Rainbow is now owned and managed by Mrs Lavinia Pashley-Wilkins BA, QTS. The change of ownership has triggered an essential reregistration process with Ofsted and although we have the same staff, utilising the same premises with the same ethos as we’ve always had, we are due to have a full inspection shortly as we are now regarded as a ‘new setting’. If you have any further questions regarding this transition please don’t hesitate to ask. To have a look at the latest Ofsted reports please click the location link below. Information regarding National Funding at Rainbow Nurseries. The Nursery Education Grant is provided for all three and four-year-olds, and specific 2-year olds with identified need. It is intended to fund a maximum of five 3-hour sessions per week for 10-12-week periods (13 Weeks Autumn term, 12 weeks Spring term and 13 weeks Summer term). Once a child exceeds 15 hours or the maximum amount of funding per term, fees will be charged per hour exceeding the 15-hour offer. Additional fees are charged at £8.50 an hour exceeding their funding (£4.25 per session or £21.25 per week). Families eligible for the additional funding (30 Hours) will require a current funding code in advance in order to utilise it for our extended sessions. The maximum additional funding we can claim per session is £12.25. Therefore, our lunch club fee will be £10. 25 and parents will be invoiced for this. Early Years Pupil Premium Funding is available for all children from lower income families. To find out if a child qualifies, the parent must complete the Achieving for Children Early Education Funding Form in full, to include National Insurance number and date of birth of respective parent. This funding goes directly to the preschool to enhance your child’s preschool learning and is additional to the grant fee payment. Click here to view our fees & funding policy. Can we talk freely to teachers about our children? 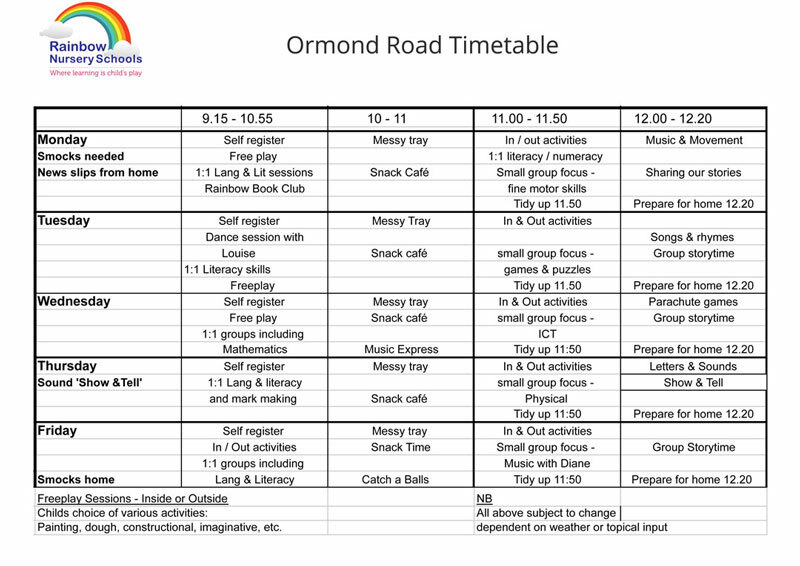 All children are assigned a Key Worker who will be the main recorder of your child’s progress during their time at Rainbow. However, it is Rainbow’s policy that you may speak to any member of staff regarding your child. We do accept payment by childcare voucher schemes. Click here to view our settling in policy. 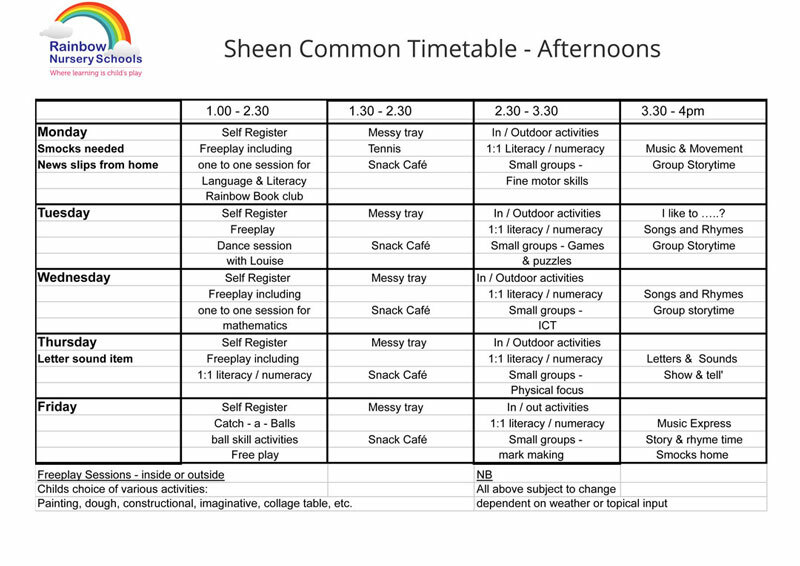 What are our Nursery School's timetables? What is our Safeguarding Policy? You can read all about our Safeguarding policy here. What is our Illness, Sunshine and Toys Policy? View our Illness, Sunshine & Toys policy here.